The easiest way to collect these files is to use Bitrise's open source codesigndoc tool. This tool runs a clean Archive on your Mac, and analyzes the Xcode log output to see which code signing files Xcode used during the Archive. This will archive your project and locate all the required code signing files and provisioning profiles and export it to a directory for you. Start your Terminal app on your macOS. Run the one liner command above for your project type. The script will download and start itself. It will ask for your Xcode project file. 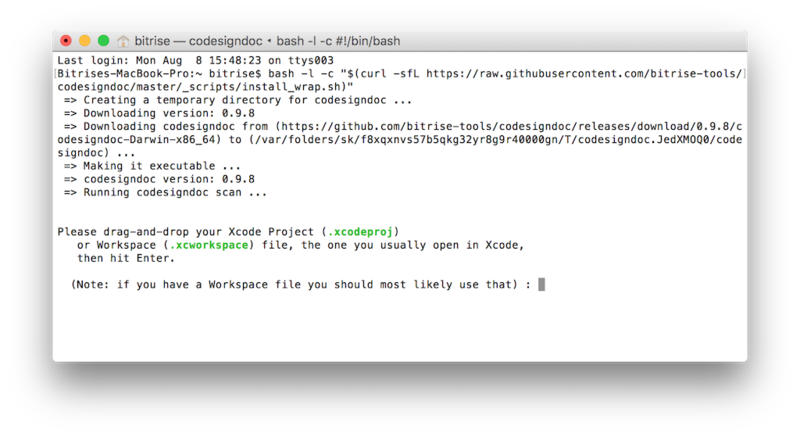 Select the xcodeproj, or xcworkspace you are using with the Finder app and simply drag and drop it to the Terminal. The script will parse your project and show all the available schemes or configurations. Select the one you are using. 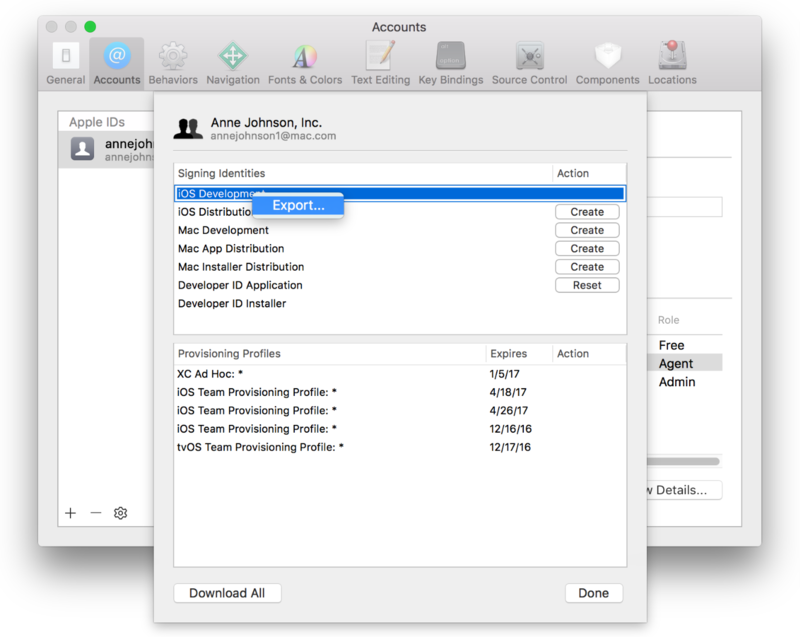 The codesigndoc tool will export all the required code signing files and provisioning profiles for you and open up a Finder window with all of them. You can upload your code signing files to Bitrise after you're done with the export and manage signing from there automatically, only by selecting targets, or even resigning during a build. Give it a try! Select Xcode > Preferences from the navigation bar. At the top of the window select Accounts. A dialog will appear where you will see your code signing identities and the provisioning profiles. Select the certificates and choose Export from the pop-up menu. Enter a filename in the Save As dialog. You can set a password and a verification to store it securely, but it's not necessary. Xcode will export the requested certificate in .p12 format. On the top left sidebar select login and on the bottom left select My Certificates. This will list all your installed certificates and the associated private key. Select the one that you would like to export and choose Export from the pop-up menu. Keychain Access will export the requested certificate in .p12 format. Locate the profile that you are looking for under Provisioning Profiles. If you don't have it installed on the system, click on the Download button next to it. Choose Show in finder from the pop-up menu, that will show you the installed provisioning profile for you. Go to https://developer.apple.com and log in. Find the Provisioning Profile you are looking for from the list or use the search to filter. Click on the selected Provisioning Profile, this will expand the details. If its status is invalid, you can click on the Edit button and save again. Click on the Download button to download it and double click to install on your macOS. You can also locate all installed Provisioning Profiles at the following path: ~/Library/MobileDevice/Provisioning Profiles/.